The Washington Capitals beat the Colorado Avalanche 4-3 (OT) Thursday night at Capital One Arena. The win improves the Capitals record to 30-18-6 (66 points) on the season. The Capitals return to the ice on Saturday when they host the Florida Panthers at Capital One Arena. Puck drop is set for 7:00 PM. The Capitals opened the scoring with a goal from Andre Burakovsky for a 1-0 lead at the first intermission. The Avs tied the game just 35 seconds into the second period, but Evgeny Kuznetsov would register a power play goal midway through the middle frame to give the Caps a 2-1 lead at the second break. Matt Niskanen would make it 3-1 just 34 second into the final frame, but the Avs would close the gap to a single goal 5:10 into the final period. The Avs would tie the game with just over two minutes remaining, making it 3-3, and sent the game to overtime. Evgeny Kuznetsov would win it for the Capitals in overtime. Scratches: Jonas Siegenthaler, Nic Dowd and Dmitrij Jaskin were the healthy scratches. Christian Djoos wrapped up his conditioning stint in Hershey and is returning to Washington. Reirden stated Djoos is a possibility for Saturday night versus the Panthers.The Capitals will need to make a roster move before Djoos can return to the roster. The Capitals opened the scoring with an early goal from Andre Burakovsky at 6:31 of the first period. The goal was setup by a nice pass from T.J. Oshie. T.J. Oshie (15) and Matt Niskanen (13) were credited with the helpers. The first period would end with the Caps leading 1-0. The Avs out-attempted the Capitals 25-16 but the Caps led in shots on goal (SOG) 12-9. Both teams were 0 for 1 on the power play in the opening frame. The Avs tied the game just 35 seconds into the second period with a tally from Nathan MacKinnon, making it 1-1. The Capitals challenged the call, claiming offsides, but the play was deemed on sides, giving the Avs a power play, but the Avs could not convert. The Capitals regained the lead with a power play goal from Evgeny Kuznetsov at 8:38 of the second period. The middle frame would close with the Capitals holding on to a 2-1 lead. The Capitals out-attempted the Avs 19-18, but the Avs led 16-15 in SOG. The Avs led 43-35 in attempts with the Caps leading 27-25 in SOG after 40 minutes of play. The Capitals were 1 for 4 and the Avs were 0 for 2 on the power play after two periods. The Capitals would stretch their lead to 3-1 with a goal from Matt Niskanen 34 seconds into the final frame. 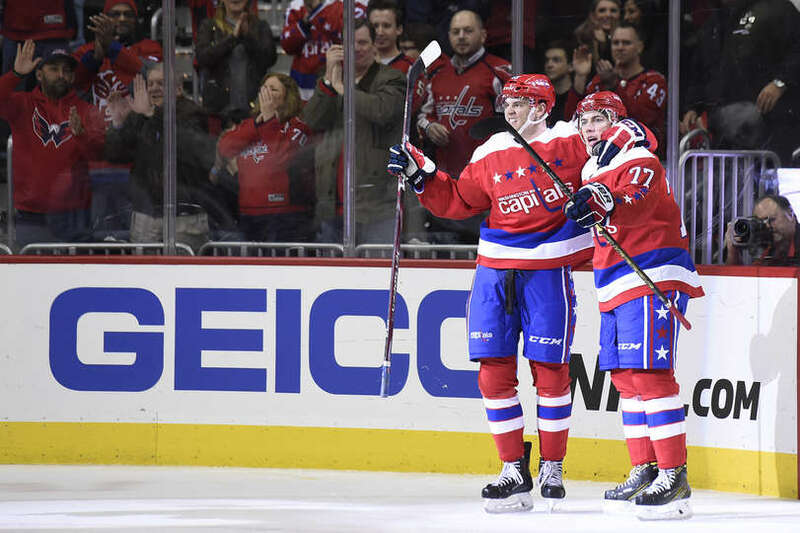 Jakub Vrana (16) and Evgeny Kuznetsov (36) were credited with the assists. The Avs would answer with a goal from Mikko Rantanen at 5:10 of the final period, making it 3-2. Tom Wilson and Ian Cole dropped the mitts midway through the final frame. Wilson took objection to a hit that Cole levied on Evgeny Kuznetsov just prior to the fight. Wilson demolished Cole. Kuznetsov would go to the room. The Avs would tie the game with just over two minutes left in the game with a goal from Colin Wilson to make it 3-3. The Capitals would win it in the extra frame with a goal from Evgeny Kuznetsov. Evgeny Kuznetsov now has seven points in the four games since the break. The Avalanche led in shot attempts 55-41. Capitals led in shots on goal 42-37. The Capitals were 1 for 6 and the Avalanche 0 for 2 on the power play. Andre Burakovsky played in his 300th NHL/Capitals game. Brett Connolly played in his 400th NHL game. This entry was posted in News and tagged Andre Burakovsky, Colorado Avalanche, Evgeny Kuznetsov, Jon Sorensen, Matt Niskanen, Philipp Grubauer, Washington Capitals. Bookmark the permalink.